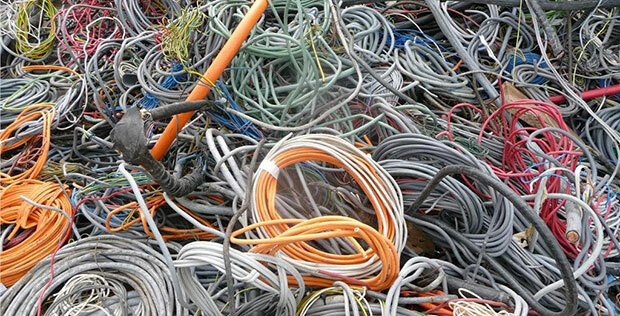 Prospect of Cable Wire Recycling Machine _ PCB recycling machine,cable wire recycling machine,E-waste recycling plant,precious metal refining machine system,E-waste shredder,plastic and metal recycling production line,copper electrolysis system-Zhengzhou Zhengyang Machinery Equipment Co.,Ltd. Copper recycling is the process of remanufacturing used or waste products into new valuable materials. Here are some reasons why copper recycling is important. Firstly, copper recycling is a good way to preserve limited natural resources.Secondly, copper recycling is a good way to make extra profit and reduce unnecessary cost . Last but not least, copper recycling is a good way to reduce pollution to our earth. Cable wire recycling machine is suitable for processing all kinds of cables including waste auto circuit wire lines and waste communication cables and the cables that cannot be processed by wire-stripping machine. The cables can be crushed and separated by this machine with high voltage static electricity. Fote copper wire recycling machine can completely separate copper and plastic and realize comprehensive utilization, so that it has high economic benefits and no dust or secondary pollution. The overall characteristics of the global Copper scrap trade are that exports from the developed countries, to Germany, Japan and other industrial production countries, but in America and Europe as well as some other important features. In America, the United States is one of the important transit countries in copper scrap trade. Canada, Mexico and Chile are the main supplier of copper scrap of America. As for export situation in 2006, for example, more than half of the copper scrap in these countries are exported to the United States. As the world’s biggest exporter of copper scrap, a large share of US Imported from these three countries copper scrap is to export to other countries. Germany and Belgium are the main destination for copper scrap export to other European countries. On the one hand, the industrial production of the two countries need a lot of copper scrap, on the other hand, the two countries exports to other countries such as China a large number of copper scrap. In addition, copper scrap recycling is affected by many factors, especially the absolute level of copper price. High copper prices can greatly improve the enthusiasm of social copper scrap recycling and can improve the overall recovery of copper scrap to a certain extent. And as the whole society’s attention to the economic sustainable development, the recycle of resources is paid attention to the government and the social from all walks of life, all which can help improve the recovery rate of copper scrap and our scrap of copper scrap on the whole.